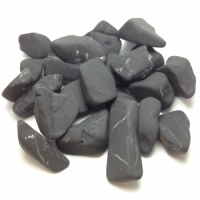 Soak and stir 200g of Shungite Chit in 1 tsp of baking soda mixed with several cups of water. Rinse your Shungite Chit very thoroughly under cool running water. Water could look grey as the loose powder is removed. DO NOT use soap. Place your well-rinsed Shungite Chit into a 2.5 litre glass or enamel container and fill with cold tap water. Use 2.5 liter of water for each 200g of Shungite Chit. Rest the water stand with the Shungite Chit in it for 24 hours. The container must be open to breathe during this process. A thin, natural fibre cloth can be used to cover the container to exclude dust and insects. 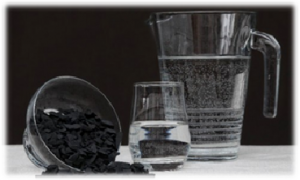 Pour the shungite-infused water into another lidded glass or ceramic container. This water is the finished water, ready for use. Refill the original shungite container with tap water to prepare a new batch. Excellent as a hair rinse. Useful for pets, birds and plants. Once a month, re-soak and stir your Shungite Chit in the baking soda/water mix as described above. Then thoroughly rinse the Shungite chit under running water. Put the chit in the sun for at least an hour to dry out and recharge. Sterilize all your containers at regular intervals. Replace the Shungite Chit with new Chit approximately every 6 – 12 months, depending on the quality of the source water.